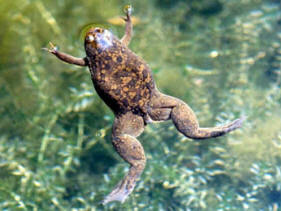 These medium sized frogs with huge back legs make an interesting pet that is easy to care for and good for beginners. There are many variations in recommendations for tank size for these critters, but being a fairly large frog they will need a good sized tank. Approximately 10 gallons per frog is a good rule of thumb. The frogs are strictly aquatic and do not need a land area. However, the water should only be about 12 inches (30 cm) deep so that the frog will be able to easily reach the surface, as they must breathe oxygen at the surface (a minimum of 6 inches is recommended to allow the frog room to maneuver). A secure lid is also a must - these frogs are adept at propelling themselves out of the water and escaping, given the chance. A gravel substrate can be used, but small gravel should be avoided to prevent accidental ingestion of the substrate. Rocks, wood, and flower pots can be used to decorate the tank and provide hiding places (frogs with no place to hide may be stressed). Artificial plants can also be used, but the frogs will dig up and generally destroy live plants. The water in the tank must be dechlorinated - using a product from the pet store designed to remove chorine (and chloramine, if necessary). It is also said that these frogs are very sensitive to toxic effects of metal ions in the water, so it is important to ensure that their water does not come in contact with metal (e.g. on the tank cover). The tank can be kept at room temperature - 68-75 F (20-24 C). No special lighting is required (indirect lighting is fine and may be preferred). A 12 hour light:12 hour dark light cycle can be used. The issue of filtration is somewhat controversial. The frogs have a sensory system (lateral line) that allows them to sense vibrations in the water, so some experts believe that using filters provides constant stressful stimuli to the frog (compared to a human constantly being exposed to the noise from a jackhammer). However, gentle filtration is used by some owners with success, and this will keep the water a lot cleaner. These frogs live in stagnant water in the wild, but that is not the same as dirty water in an aquarium. If no filtration is used, the water should be nearly fully changed every week, if not more often. These frogs will take many kinds of foods, live or not. Many owners are feeding floating reptile sticks with success. While these are relatively well balanced, feeding a variety of food is still a good idea. Items such as bloodworms, waxworms, earthworms, feeder fish such as guppies, brine shrimp, and dog and cat food can all be fed. In addition, a commercial food for clawed frogs can be purchased via mail order from companies such as Xenopus Express (these frogs are used fairly extensively in research so are available along with supplies quite readily). As long as a balanced food is used as the basis for the diet, supplementation with vitamins and minerals is not necessary. Feed the amount they will clear from the water in 10-15 minutes, daily. Some sources say fully grown frogs only need to feed 3-4 times a week. In general over feeding is more of a problem than under feeding, so you can feed daily and keep an eye on the body shape of your frog--if it seems to be getting overweight, then you can cut back a bit. Clawed frogs often become quite tame over time, taking food directly from the fingers of their owners. They do sometimes accidentally nibble on the fingers, but lack teeth so this is not a big problem. These frogs are also lack tongues, and feed by stuffing food into their mouths with their front legs. They can be quite messy as a result! Note: These frogs are in the same family but different genus than the dwarf African frog, Hymenochirus boettgeri which has become very popular in recent years. However, the care of dwarf frogs is similar (on a smaller scale).